BUY SMARTER. SEAL SMARTER. SAVE MONEY. Stop Throwing Cash in the Trash! Throwing away food is like throwing away money. Using the FoodSaver® system to store and protect your food prevents waste caused by spoilage and freezer burn. 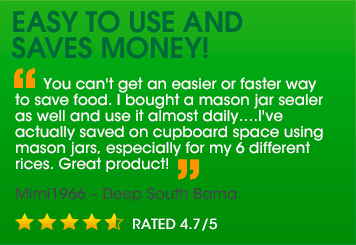 Plus, you can save even more when buying in bulk and still maintain freshness during long-term storage. Home-cooked leftovers or that doggie bag from a restaurant splurge can be saved up to 5X longer and enjoyed again, even weeks after it’s sealed. Make your purchases of foods when they are in season and cost less so you don’t have to pay a premium when they are in demand. You can enjoy fresh berries and veggies in the winter without any budget worries.